Ontario’s digital frontier includes distance learning, which provides greater opportunities to remote communities across the province. Thanks to a partnership between Contact North | Contact Nord and ORION, students can access rich content from Ontario’s best universities and colleges. In June 2015, Jessica Taylor celebrated her graduation from Confederation College’s Early Childhood Education Diploma program… right in her hometown of Ginoogaming First Nation, a small community in northwestern Ontario. Taylor is one of a growing number of people earning degrees and diplomas online. She tried out university in Thunder Bay, a four-hour drive away. Although she got good grades, she missed her family and community too much. So, she decided to stay home and enrol in an online program to further her career opportunities. For students like Taylor, “going to school” no longer means leaving the community. Contact North | Contact Nord is Ontario’s distance education and training network, providing 112 online learning centres where Ontario residents can access courses to get a degree, diploma or certificate or upgrade their skills through online learning with personalized support in their community. Through partnerships with Ontario’s 24 public colleges, 22 public universities and 250 literacy and basic skills and training providers, students can choose between 1,000 online programs and 18,000 online courses they can complete at a distance. Each centre provides quiet spaces for working, connecting with other students, and taking supervised exams. “I liked online learning. I can work at my own pace, not in a huge classroom with hundreds of people,” Taylor said. Online learning is not just convenient for people like Taylor living in the North. It’s a critically important tool to enhance economic development and preserve communities. Helping young people learn 21st-century skills will mean that they can stay and be employed in their communities, rather than moving away to other parts of Canada. Contact North | Contact Nord delivers connectivity to the communities it serves, including Ginoogaming First Nation, while ORION connects Ontario’s post-secondary institutions to Contact North | Contact Nord’s hubs in Thunder Bay and Sudbury. 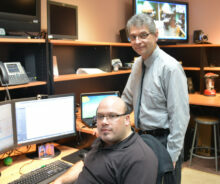 Paul Porlier, director of information technology and web services at Contact North with Daniel Seguin, information technology specialist. Ensuring that each and every community in Ontario has reliable access to rich educational content is a big task. ORION will continue to work with partners like Contact North | Contact Nord to bring greater opportunity to these diverse learners, enabling students to learn any time, anywhere. 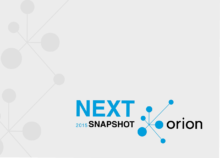 Learn more about what’s next for ORION and its community by reading our 2015 Snapshot.